MY 2007 to MY 2016 (NS, NT, NW & NX) Pajero vehicles fitted with a Takata airbag inflator. Airbag inflator: As it gets older, a combination of high temperatures and humidity can cause the airbag inflator propellant to degrade. If an affected vehicle is involved in a collision triggering the airbag, the metal inflator housing may explode/rupture under too much internal pressure. In the event that a defective airbag inflator ruptures, metal fragments may propel out through the airbag cushion towards the vehicle occupants causing serious injury or fatality. Owners of affected vehicles should contact their local Mitsubishi dealership or Mitsubishi head office directly via the website at https://www.mitsubishi-motors.com.au/customer-assistance/contact-us to arrange for a replacement airbag inflator free of charge. 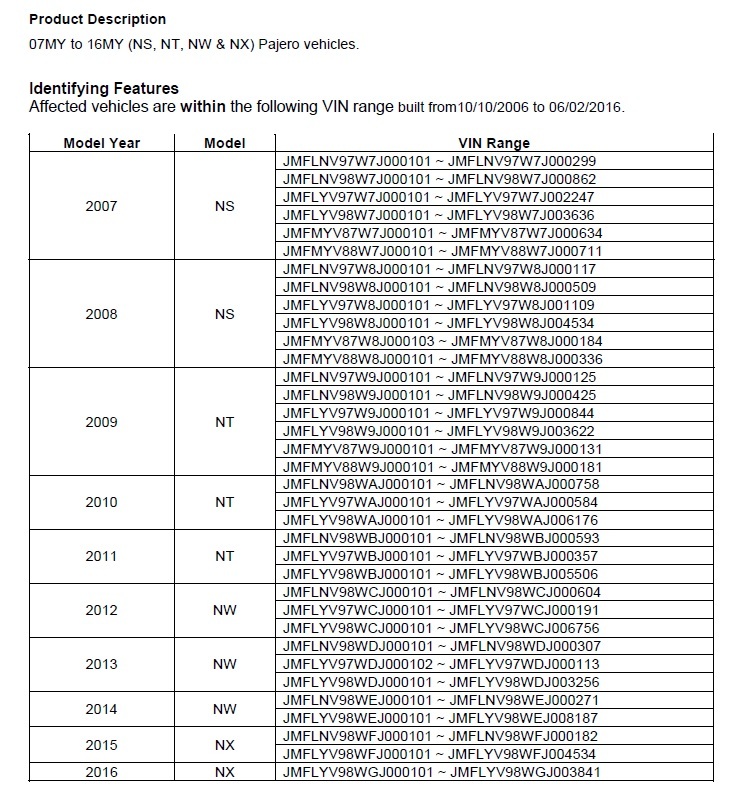 Consumers who are unsure whether they are affected can also use Mitsubishi's VIN look-up tool https://www.mitsubishi-motors.com.au/customer-assistance/vehicle-recalls or contact Mitsubishi on 1300 13 12 11 or contact their preferred dealer. We also recommend you visit https://www.productsafety.gov.au/newsletter/subscribe to subscribe to receive updates about current and future recalls as they are published.